Having been here in Oregon now for about four and a half months, starting with a quick introduction via the Wine Bloggers’ Conference held in Portland in September and culminating with the harvest season, I have had a chance to learn a bit about the wonderful valley that I now live in. While it is not Spain’s La Rioja, with its full-bodied sour cherry and oaky Tempranillos and Grenaches, the Willamette Valley of Oregon has another breed of wine, an American story different from that of California and La Rioja. Oregon‘s wine country, like its people, is slower-paced, more personal and less pretentious than some other wine regions. Oregon is not a state where you will find extremely large wineries; instead you will find wineries with less than 3000 cases made annually. Oregon is dominated by a mom-and-pop type of mentality and a family-like consensus-driven way of working. Oregon’s wines are mostly hand-grown, hand-harvested, hand-sorted, and hand-made. There are very few mechanically harvested wines in Oregon due to differences in training systems throughout the state. Every step of the winemaking process is touched in one way or another by a human. Oregon is also leading the charge for organic, sustainable and biodynamic viticulture. Located right at the 45th parallel, the Willamette Valley is considered a cool-climate region for grape growing. This region is primarily known for Pinot Noir and Pinot Gris but has also become home to new varietals such as Gruner Veltliner and even Riesling. The valley is protected by the Coast Range but also benefits from the cool marine air. In Willamette Valley it is believed that a cooler climate is more suitable to Pinot Noir than a warmer one. The valley is also known for its soil conditions and mild temperatures, creating the right terroir for its famed Pinot Noir. A few good friends from Australia who came to visit me right after the harvest season asked me to give them a tour of the region. I thought it only made sense to take them to a few places I feel represent this valley for them to see and taste…a little red, a little white and some bubbly. Eola Amity Hills AVA, to visit Bethel Heights. We had wanted to make it to Cristom and Saint Innnocent. but unfortunately there just wasn’t enough time. We also toured Willamette Valley Vineyard, which is among the largest in production in Oregon. Ted Casteel from Bethel Heights took the time to talk to us about how they got started in 1977. For more information or to visit them, please visit their homepage at Bethel Heights. 2. Chehalem Mountain AVA, to visit the Ponzi Wine Bar. Founded in 1970, this is another family-owned business that is now a second-generation-run winery, with Michel Ponzi as the Co-Owner, Maria Ponzi as the Director of Sales and Marketing, and their sister, Luiza Ponzi as winemaker. As there honestly was not enough time to drive all the way up to Ponzi’s main location, I took my Australian friends to the Wine Bar they have in Dundee. We had a bite to eat with a nice tasting of wine to accompany it. I had a chance to try their Dolcetto made from an Italian varietal, which was a nice surprise. They make Pinot Noir, Pinot Gris, Pinot Blanc, Chardonnay and White Riesling, as well as Arneis and Dolcetto, two rare Italian varietals. Please visit them at Ponzi Vineyards. 3. Dundee Hills AVA, to visit Argyle Winery. In my opinion, Argyle Winery makes some of the best sparkling wines (i.e., Champagne style) in the valley. I would highly recommend a visit to this winery to try their POP Flight. They have a number of 90+ point wines highly recommended by Wine Spectator and Wine Advocate. They also happen to be located right across the street from the Ponzi Wine Bar, so you can grab a bite and then head over there for after-meal sparkling delights. Please visit them at Argyle Winery. When you are looking to find some other great places to visit, do feel free to send me an e-mail, and I will do my best to give you recommendations. 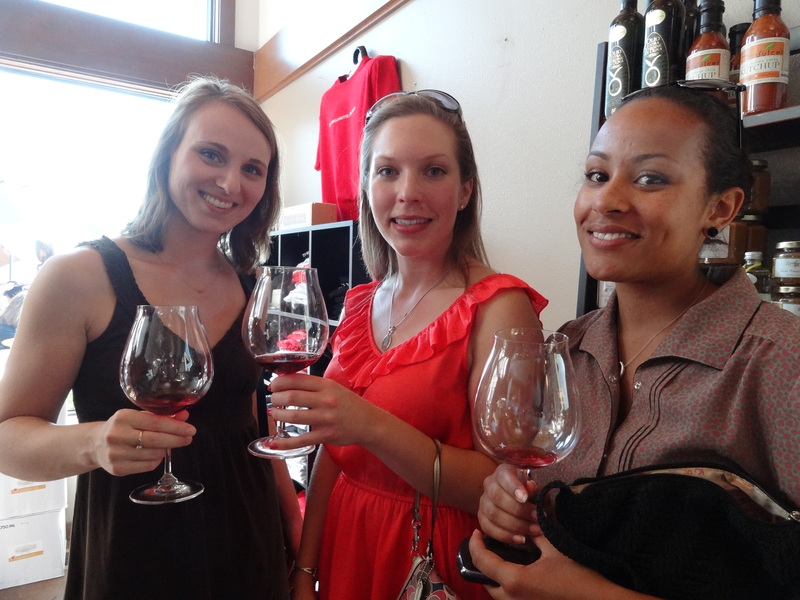 We hope to see more of you in the region to taste some of the great wines coming out of the Willamette Valley. Harvest may be over but the Stomping has just begun! Every year, Willamette Valley Vineyard (WVV) hosts a grape stomp which is a qualifying competition for the World Grape Stomping competition in Santa Rosa. Wende Bennette of WVV explains the ins and outs of this competition. I hope you enjoy the video as much as we enjoyed our time there. Special thanks to WVV for sharing their great wines and experiences with the two amazing grape stomping teams that included Anna, Heather, and Ashleigh aka So Juicy and the Stompstastic Chicas! In this video, the pros show you how you really should do it in order to extract the maximum amount of juice from the berries. Check out their Willamette Valley Vineyards 2009 Estate Pinot Noir which was rated 95 points by Portland Monthly this past month! In preparation for this year’s harvest, I thought I would show you what I did last year as part of my masters program at University of La Rioja in Logroño, Spain. I had a chance to work with Juan Carlos Sancha at his Ad Libitum Winery in Baños de Río Tobía, La Rioja, Spain. We participated in the 2011 harvest, analysis and watched as the fermentation process began at this artisan winery. Bet yet…visit them in La Rioja, Spain! Juan Carlos and Marian will take incredible care of you!